You might say the month got off to a rocky start for this understandably angry hedgehog. In fact, he himself was nearly turned to stone. Thankfully, things are looking up again. The prickly little animal was rescued by the Brent Lodge Wildlife Hospital last week after having an unfortunate encounter with a curious dog in Chichester, England. 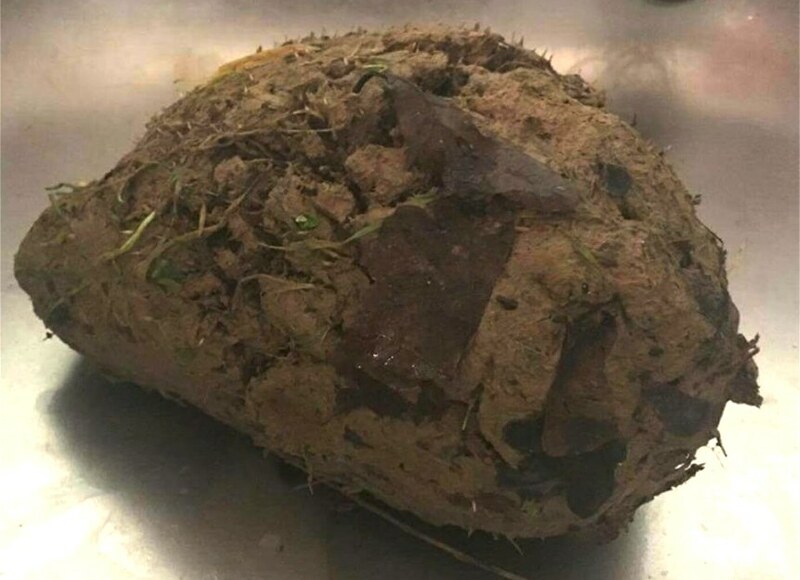 It seems as the canine threat approached, the hedgehog tucked himself into a defensive ball — but apparently that didn't stop the pup from rolling him through an area of wet clay . And when the clay hardened, the poor guy got stuck. "He was barely recognizable when he came in but we could see he was just about breathing (goodness knows how)," the hospital wrote online, adding later: "He was hissing a lot and getting generally agitated." Despite his ill-temper, help was still on the way. It's unclear exactly what the cleaning process entailed, but the hedgehog's rescuers report that he didn't much care for that, either. "We have got the worst of the clay off but will leave him quietly over night now and clean off some more in the morning as he became a little cold and VERY angry," they wrote. "For now he is tucked up with some food feeling very sorry for himself." After a followup cleaning, the hedgehog looked markedly more like a, well, a hedgehog. "He is much more mobile and a lot happier," his rescuers wrote. "He is now bedded down quietly after his ordeal (both from the dog and from us cleaning him) with a nice big bowl of food." He even opened up to the people who helped him — literally. With any luck, the hedgehog will soon be able to put this whole unpleasant experience behind him, and return to his home in the wild. It's worth mentioning that the Brent Lodge Wildlife Hospital is a volunteer run organization that cares for thousands of animal patients every year. To learn more about their work, and to find out how to help, visit their website here.